I think there is nothing sweeter, more perfect, than a wee little baby face. I must have spent hours just watching Ruby Sky's beautiful little face. How can those curves be so perfect? 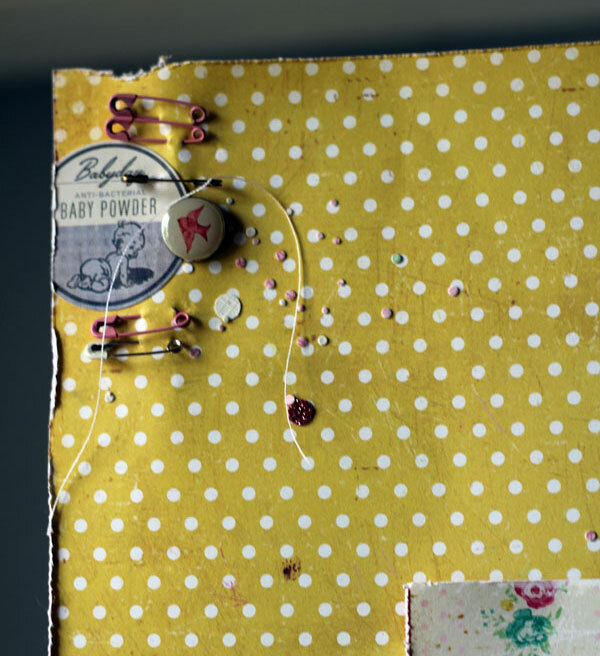 I used LOTS of Crate Paper Little Bo Peep on this page. 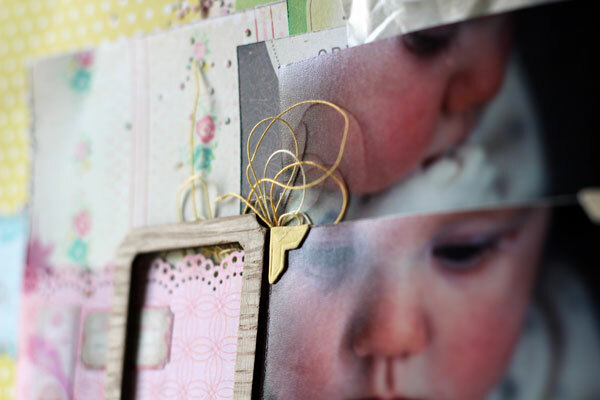 These muted colours were perfect for the soft colouring and feel of my photos. I made an envelope from a sheet of Hazel and filled it and covered it with pieces from the phrase sticker sheet, the border sticker sheet, and the accent cuts patterned paper sheet. 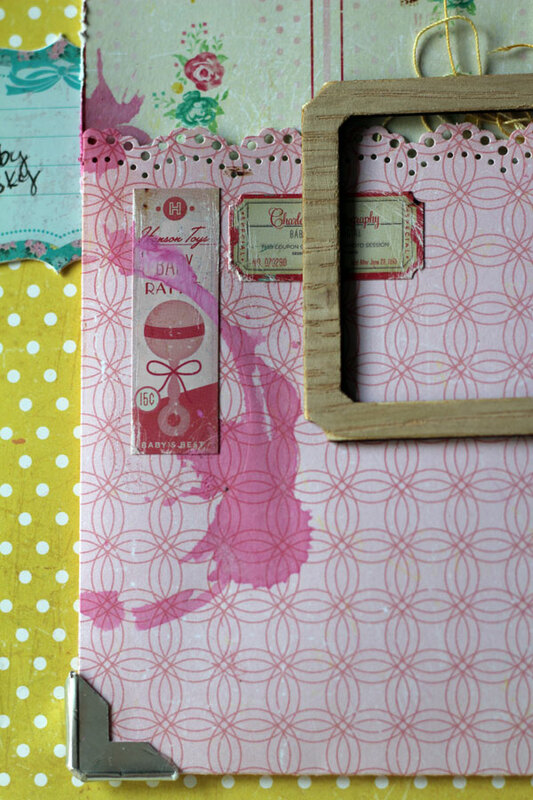 That yellow polka dot for the background is one of my favourites from the whole collection! It is the b-side of Alice. Love that it is a sort of pretty muted mustard colour instead of a typical baby yellow. These grey foam Thickers are such a perfect colour! I stuck the label from the phrase sticker sheet to a piece of chipboard and trimmed around it, then scuffed up the edges a bit. I love the 50's vintage vibe to this collection. So fun. I tucked a little nest of embroidery cotton behind one of the CP Little Bo Peep wood veneer frames. I layered together photos, a vellum envelope, some pieces cut from the accent cuts sheet, old book pages, a green shipping tag, and journalling typed on my old typewriter. These little stickers were cut from the border sticker sheet. Thought they felt a bit like stamps, and they worked well on the big envelop! I made a coffee ring out of some ink -- not sure what kind of coffee that is, but sign me up for bright pink caffeine! 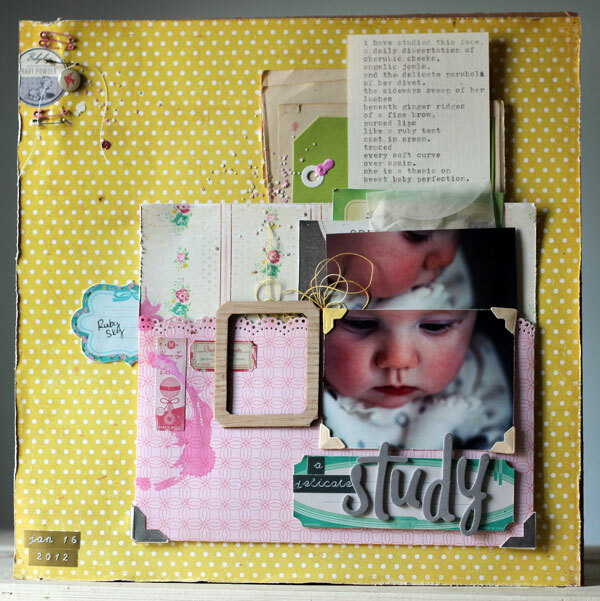 That shiny photo corner is one of my scrapbooking secrets. The kind of secret that I think would make REAL scrapbookers look at me with horror, and slowly back away. But I'm going to tell you about it, because... well, why not. It's punched out of the box that my face wash came in! I couldn't resist using it, it was such a nice heavy cardstock weight, and so shiny. Supplies: patterned paper (Crate Paper Little Bo Peep collection); stickers (Crate Paper Little Bo Peep Collection); decorative brad (Crate Paper Little Bo Peep collection); letter stickers (Crate Paper Little Bo Peep Thickers); wood veneer frame (Crate Paper Little Bo Peep collection); photo corners (Heidi Swapp); punches (Martha Stewart, Fiskars); mini safety pins (Making Memories); misc tag, vellum envelope, thread. this layout is absolutely gorgeous, love everything about it! and yay for grey thickers!! This is lovely. So beautiful. I love all of the layers of gorgeous embellishments. 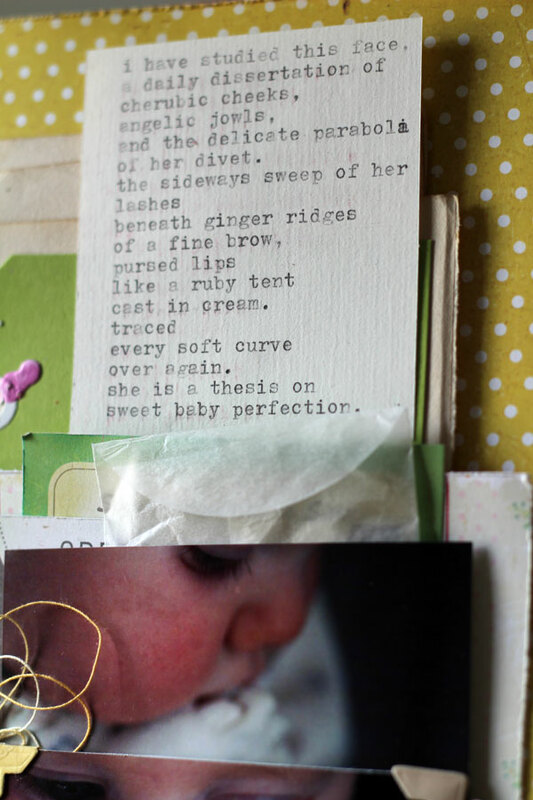 A beautiful page and darling photo, but mostly I adore your poem! What a precious baby photo. So pretty! I'm with you, there is nothing more precious than a baby face! Besides baby hands, and baby feet... ;) This is so beautiful! Thank you so much for sharing at my Throwback Thursday party. I would love to see you again this week!